The conference is being hosted by the Victoria University College of Arts & Education and organised by Honorary Professor John Tully with the assistance of the Kurdish Democratic Community Centre of Victoria and Australians for Kurdistan. It will be held at the city campus of Victoria University (300 Flinders Street, Melbourne). For six years Syria has been engulfed in a terrible war. The original democratic revolt against the Assad regime has given way to a brutal multi-sided conflict. But in the midst of this carnage, under threat on all sides, the freedom struggle in Rojava is a shining beacon of hope. 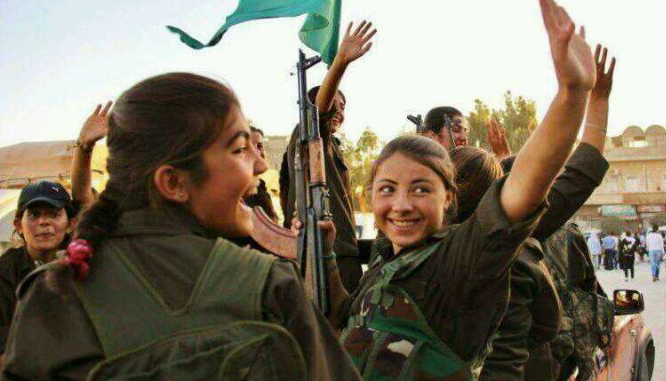 Initially a struggle for Kurdish self-determination, the liberation forces have established the Democratic Federal System of Northern Syria as a model for a multi-ethnic, federal and socially just Syria. Defended by its heroic male and female fighters, today an all-out effort is being put into building a radical commune-style democracy. Unprecedented efforts are being made to empower women. A new society is being created where Kurds, Arabs, Assyrians, Turkmen and other ethnic and religious groups can live together in harmony and cooperation. Two international guests are confirmed to participate in the conference. They now have to surmount Australia’s often restrictive “border control” regime.and secure entry visas. But whether they are allowed to join us physically or are forced to Skype in they will definitely participate. Saleh Muslim, co-chair of the Kurdish-based Democratic Union Party (PYD) and the most prominent representative of the Democratic Federal System, will be a keynote speaker. German feminist and Kurdish solidarity activist Anja Flach is another confirmed international guest. She has made numerous visits to Kurdistan over the years and is a co-author of the excellent book Revolution in Rojava: Democratic Autonomy and Women’s Liberation in Syrian Kurdistan. It is also hoped that Flach will speak at post-conference meetings in both Melbourne and Sydney. In addition, a further two guests are unable to travel and will participate via Skype. Ercan Ayboga is an environmental engineer and activist currently based in Germany. He is a co-author of The Rojava Revolution. He will speak to the conference on the ecological problems in northern Syria and the response of the liberation forces to these. Tickets may be purchased from https://www.trybooking.com/PWTZ. An initial draft agenda is available on the Rojava Conference page on this site. This entry was posted in Australia, Rojava and tagged Rojava by AFK. Bookmark the permalink.